This guy googled 'Teflon' when his dad died. Now his town's a toxic water contamination site. It was like a bad dream. Michael Hickey, 37, typed “Teflon” and “cancer” into Google on an otherwise unremarkable March day in 2014. A high school teacher in his tiny town of Hoosick Falls, New York, had just died of cancer, and Hickey was thinking about his father, who’d died of kidney cancer the year before. Too much cancer, he thought. It never seemed quite right, his father’s death. He’d never seen his father drink or smoke. He was only 68, relatively young, their doctor said, to have gotten so aggressive a disease. So a few days after the high school teacher died, Hickey typed “Teflon” and “cancer” into Google. Teflon is big business in Hoosick Falls: Manufacturers began making Teflon products there in 1955, and a local factory owned by multinational corporation Saint-Gobain now employed about 200 in the town of 3,400. The Saint-Gobain factory is about 300 yards from the underground wells that supply water to the village. Hickey’s father’s house was on the same street. For 32 years, Hickey’s father worked two jobs: a 40-hour week working nights on the factory line at Saint-Gobain, and a school bus route, mornings and afternoons. He slept while the kids were at school. He was something of an institution; Of many of the kids he drove to school in his last decade, he’d also driven their parents. He had been about to retire when he died. It was on a hunch when Michael Hickey typed in “Teflon” and “cancer” into Google. When he clicked on a result, “kidney cancer” was the first thing he saw on a list of diseases found to have a “probable link” to exposure to perfluorooctanoic acid or PFOA, a Teflon ingredient, by a major study, known as the C8 Science Panel. It was published in 2013 after the chemical was found to be heavily contaminating the groundwater in a cancer-riddled Teflon town in West Virginia, home to a large Dupont factory. Shortly after that Google search, Hickey bought a few water testing kits, and sampled water from his house and his mother’s house, and from two local businesses. They all came back with elevated levels of PFOA, and his house and his mother’s were both at levels well above the EPA’s recommended limit of 400 parts per trillion (ppt), at 540ppt and 460ppt, respectively (the EPA has since lowered its recommended limit down to 70ppt). 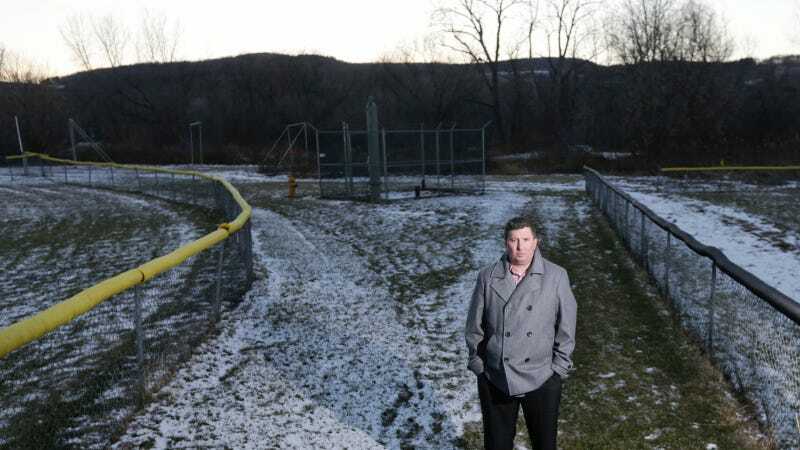 Now, two and a half years after Hickey brought his test results to the attention of the Hoosick Falls mayor’s office, the EPA has recommended the Saint-Gobain factory be added to the federal Superfund list of the most contaminated sites in the country. Officials say that PFOA was likely polluting the town’s water supply for thirty years or more. In this Jan. 20, 2016, photo, Michael Hickey, left, Dr. Marcus Martinez, center, and lawyer David Engel pose for a photo in Hickey's dining room in Hoosick Fall, N.Y. They formed the grass-roots group Healthy Hoosick Water to press officials to investigate and find a solution after lab tests paid for by Hickey detected the chemical PFOA in the municipal water supply of Hoosick Falls. Hoosick Falls is a tiny town virtually absent from national consciousness, but it may be about to become a household name as one of the biggest—and most preventable—environmental disasters New York has seen in years. The Superfund designation comes as New York is grappling with a number of other water crises that suggest a regulatory system thoroughly misfiring: The New York Times reported that lead levels in New York City schools’ water systems may have been artificially deflated in tests by way of a practice of flushing water lines before taking samples, and high levels of lead were recently found in school faucets in Voorheesville, Manlius, and Mount Vernon, New York. The city of Newburgh, in the Hudson Valley, had its water shut off this spring after officials found PFOS, a fire-fighting chemical closely related to PFOA, in the town’s drinking water supply. Harvard researchers recently found that about 6 million Americans drink water tainted by either PFOS or PFOA. Both chemicals are still used widely across the U.S.
That a toxic substance managed to go unnoticed in the Hoosick Falls water supply for so long is darkly unsurprising to anyone mildly versed in how chemicals are regulated in the United States. Like roughly 80,000 chemicals approved for use in the U.S., PFOA is not currently regulated by the EPA. The agency keeps a short list of “emerging contaminants,” chemicals approved for use but which they suspect may cause some sort of harm, and which have yet to undergo the rigorous and lengthy process to actually verify that suspicion. PFOA is on that list, so the EPA sets a recommended (though nonbinding) maximum exposure level that states can choose to comply with or not. Then, every five years the EPA “does some random sampling at public water supplies nationwide,” to determine if those unregulated contaminants are showing up at widespread enough rates to merit a national rule, Judith Enck, the administrator of EPA’s Region 2 office in charge of New York, told me. Except not if the water supply serves a community of less than 10,000 people. The EPA doesn’t test those at all, leaving them entirely to state jurisdiction. That is why no one knew PFOA was lurking in the water in Hoosick Falls. Over that year, while the village and state Department of Health went back and forth to determine the best way to handle the contaminant (eventually settling on a granulated carbon filter, a permanent version of which is set to be installed this coming December) no one told residents to stop drinking the water—not until December 2015, when Enck, having been notified two months prior, became frustrated with hesitation from local authorities and issued a do-not-drink letter. Blood tests the state offered residents this spring came back with alarming results: As personal medical information, test results aren’t posted publicly, but O’Leary started a Facebook group where residents could compare their blood serum numbers if they wished; “The numbers I was receiving for children were heartbreaking, some of these were disgusting. Some were in the 500 range, some in the 800.” Hickey remembers one man telling him his serum level was 1600ppt. The national average for PFOA in blood is about two ppt. Now O’Leary, who moved her family into Hoosick Falls only last year, is trying to find a way to move out of it. She says the unrelenting news of illnesses is too much, and she still doesn’t trust the water; The town installed a temporary water filtration system in February, but her family is still carting cases of bottled water home. O’Leary remembers her move-in day well: she’d been excited. It was the first house she and her family—her husband, a truck driver, and her two kids, a girl, 14, and a boy, 10—truly owned. They’d spent time vetting the small town, and everything seemed perfect; it was quiet, but not too quiet, and rural, but not too rural. The schools were good. “We got the house cheap. Now I’m wondering if I know why we got such a deal,” she told me. “We tried to bottle feed them, everything. One was born with its whole right eye hanging out of its face. I probably wouldn’t have thought anything of it a few years ago,” she says, but now she can’t help but wonder if it was the water. In this Thursday, Jan. 21, 2016 photo, Zander Spurr, a fifth grader at St. Mary's Academy, drinks water from a water bottle that has been set up in the school in Hoosick Falls, N.Y. Federal regulators have warned residents of the upstate New York factory village near the Vermont border not to drink water from municipal wells, and a plastics plant has agreed to supply bottled water and pay for a new filtration system. New York state is currently going through two decades of medical records, to see if Hoosick Falls residents have indeed had a higher rate of cancer than the rest of the country. Results are due back next month. But not everyone in the town is as willing to as O’Leary and Hickey to draw a connection between the local Teflon plant and potentially catastrophic disease. Hickey doesn’t plan to move; His family has been in Hoosick Falls for five generations, and he loves the town. But the endless months of haranguing officials into paying attention to his tiny town have taken a toll. “It’s been a tough couple years,” he says. When Hickey finally got to testify in front of the New York State Senate this August, he was visibly distraught. After hundreds of hours of research and phone calls—his whole last two years, really—Hickey just wanted something to change, to make sure this never happened again. He’d written a speech the night before, but when he woke up the morning of the hearing, he decided to can it. Instead, he spoke about his father: How he’d worked those two jobs his whole working life, the factory and then the bus route, every day the same. How 32 years of Hoosick Falls’ kids rode his bus and how he’d bought holiday presents for probably all of them. How he was about to retire when the diagnosis came. How it came just when Hickey’s fiance was about to have their son, and how she gave birth the same day that his father went into surgery to have his kidney removed, both in the same hospital, just on different floors. How both events went the best he could have hoped for: His son was born healthy, and the surgery had nabbed all the cancer, or so they’d thought. How he’d walked down from the maternity ward to his father’s hospital room to tell him they’d named the baby after him. How the cancer came back about a year later. How it never left, not without taking his father with it. How this was never supposed to happen. How it wasn’t rocket science (at least not any more); it was Teflon.